HD4 production end 2008 - HD5 production end 2012. HD6.x 2016. HD7 2018. 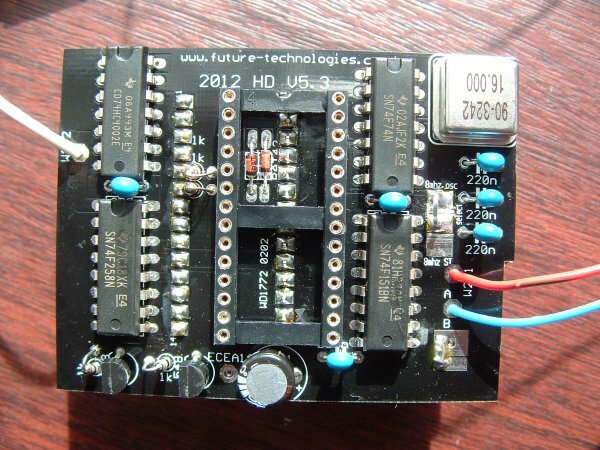 The HD4/5 board holds a simple but clever design which changes the ST's disk controller instructions to make it function in 1.44 and 720k modes. Most kits require you to modify TOS or install software patches for TOS to work with high density disks. These patches often change the default seek rate to 6ms. This is required since when running in highdensity mode the seek rate halves. If this modification wasn't done the seek rate would go down to as little as 1.5ms and most floppy drives would not function at this speed. The HD5 module keeps a watch on the commands which the ST sends to the floppy controller and when it sees a seek rate command the board jumps into action and changes the commands "on the fly". This gives you the freedom of a fully automatic board which requires no special software to be installed. Its a simple "set and forget" type solution. The module supports both 1.44 & 720K modes internal/external drives in any combination. The HD4 kit was Developed in the very early 90s when 1.44 kits were all the rage. Having fitted various kits to my own ST's over the years I decided to build my own. The documents online were, as always, full of errors or incomplete making study difficult. They all needed track cutting, wires all over the place soldered onto other IC's, and more annoying needed software to work. 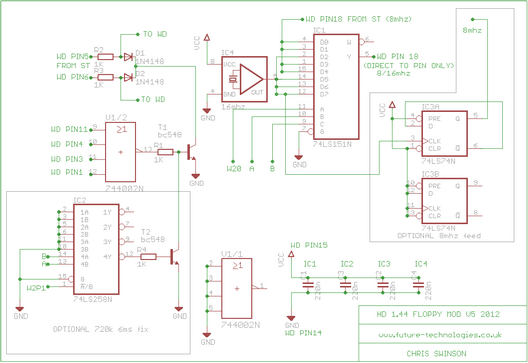 I decided I wanted a software free version as other kits I used I kept on loosing the driver floppy!.So I designed the HD4 module which is a software free fully automatic hardware solution. HD5 was produced in 2012 with a updated PCB design and now supports 6ms/3ms on the fly switching. Also I noticed a lot of other designs when switching to 16mhz mode, stayed in 16mhz mode even when the floppy drive was not in use. This just unnecessarily stressed the WD1772 causing overheating and failure over time. My design only switches to 16mhz when its accessing the floppy drive. So overheating and stress is kept to a minimum. 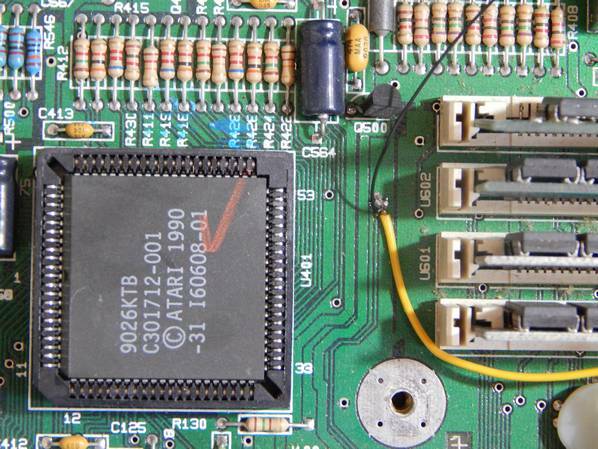 With this method, almost zero 1772s failed in 16mhz mode even after consecutively formatting several 1.44 floppies. Fitting instructions show HD4 module but overall fitting is the same for HD5. Please read all information carefully before fitting. 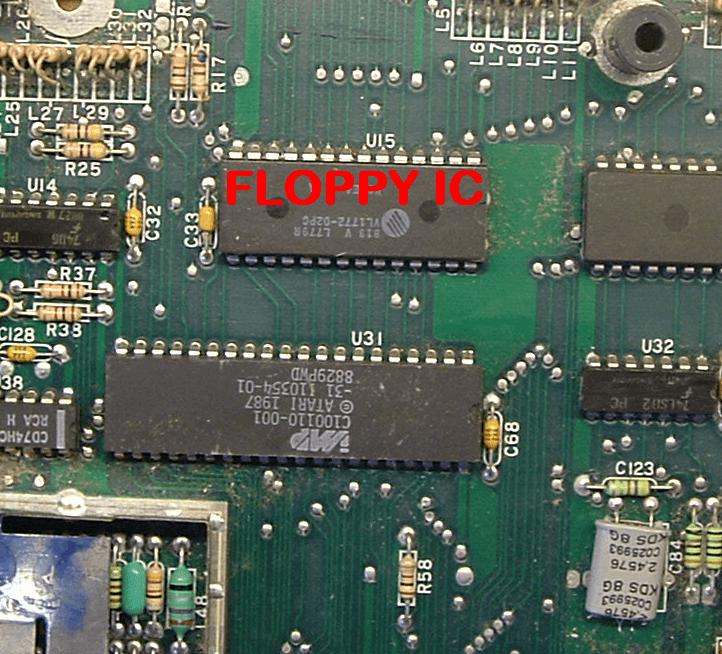 First we locate the Floppy Controller IC. Generally they all have "1772" and will start with "WD" or "VL" depending on manufacture. Great care must be taken when removing the IC. The ST motherboard is fragile and the copper tracks and pads are VERY fragile. A steady hand and good soldering skills are a must. NOTE - If your 1772 is in a socket then the socket MUST be removed. NOTE - If "U31" is in a socket, then the socket must be removed and U31 soldered direct into the motherboard. Failing to do so may not allow the HD module to sit low enough down and the floppy drive may not seat correctly. 1.44 Floppy upgrade which I designed some years ago back around early 90's. I choose to use 2 logic chips. 1 chip controls the HD/A/B select lines, the other is a "command watcher" which monitors RW/CMD lines. The good thing about the 1772 is that the step rate command for 3mS was (going from memory) "11" for the LSB lines. So 6mS was "00" on the LSB lines. So the "command watcher" looks for the Step Rate Read Command then with related parts (transistor, resistors) forces these 2 lines low and always switches to 6mS. So now no matter what the ST "tries" to set the 1772 at, the board always changes this to 6mS "on the fly". 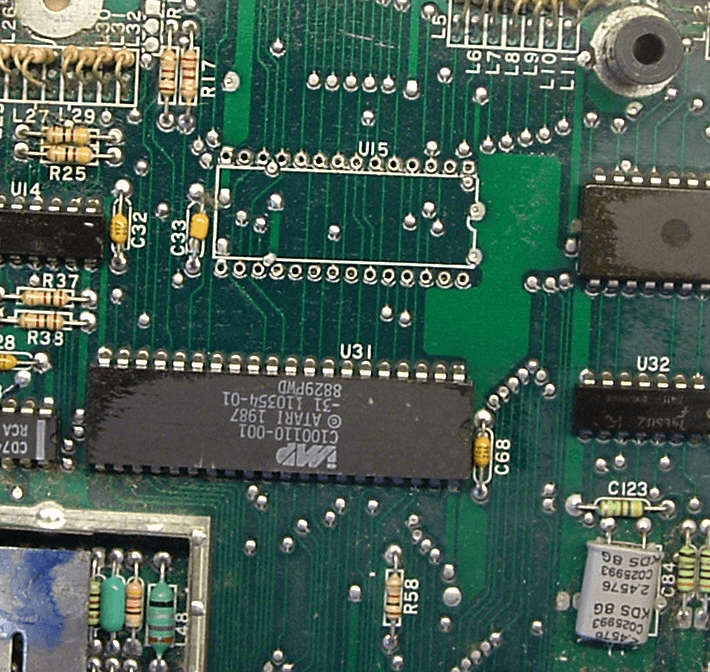 As the board only changes the command data, it does not touch any actual data to or from the floppy drive so the board is totally transparent during every RW operation and the only thing it touch's is the Step Rate command which simply "inverts" 2 databits to force 6mS operation. I opted to use a onboard 16mhz crystal. There are some old "arguments" about using the 16mhz source near the Shifter. Though I recall there was some issues with doing this with some combinations of motherboard/hardware which made it not reliable for some reason. I did not spend any time looking into that, so just opted for a clean 16mhz source. Though there is no reason not to leave the crystal off and try your luck with the shifter 16mhz line instead. 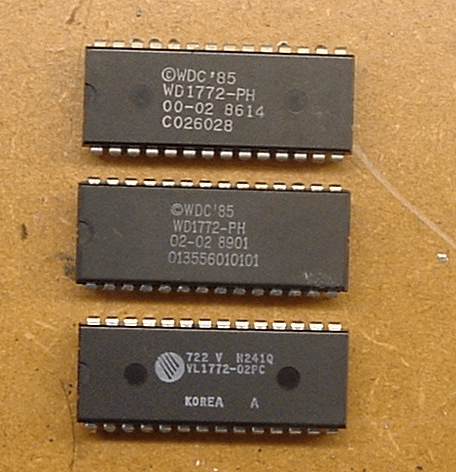 These IC's were taken from old Atari's. They all worked fine at 16mhz. I noticed the VL1772 got a little hotter than the WD chips. UPDATE July 28, 2016 : I have noticed a 00-02 IC struggling with HD extended formatted floppies. I do not come across them often so hard o get a proper "feel" for them. All others tested recently seem good for 16MHz. The HD select was soldered on (white wire on image, blue wire on HD5 kit). the Drive Select also altered. More info here about drive ID0 select Mods. And as always, perfect operation in 1.44 mode! There are a lot of 1.44 drives on the market. At the time of testing (some 10 years ago ) none of them supported extended formats other than the MPF920. Some drives were simply not adaptable for use with the Atari. It is important to only use a drive which supports extended formations as a lot of floppys used 10 sectors rather than 9 sectors, and up to 80 tracks. Some floppys will become un-redable if the wrong floppy drive is used. Some drives had limited support for extended formats but it is very "hit and miss" without actually trying them. The MPF920 drive is the only drive that I suggest to use. It has proven long term reliable and offers the best extended formats possible. Unfortunatly the Sony stopped production on the MPF drive around 2010 so it is becomming harder to find now. Any formatter will work that supports 1.44 HD floppies! Even latter versions of GEM support HD formatting and works fine there also, be it limited to a fixed format and seems to take forever! 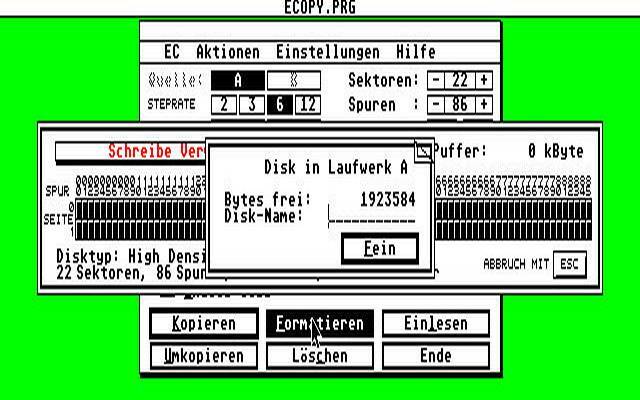 Ecopy is a nice program to use, be it in German though :-( I found it nice as it can alter a lot of floppy items including the boot sector! HD 5xx series contains 6ms step rate fix in 720k mode, along with onboard 8mhz clock option. PCB holds improved smoothing capacitors which allow more 1772 chips to function correctly in 16mhz modes. This can also help improve ST stability and may also help with sound and video quality. Please note HD4 colour wires are different than HD5. So please follow the colour codes in this section if you have HD5 module, and follow the colour codes for HD4 if thats the module you are fitting. HD4 & HD5 are fitted to the motherboard otherwise exactly the same. WHITE WIRE (HD5) - Connects to the ST motherboard on the W2 link pads at pin 2. RED WIRE (HD5) - Connects to the ST motherboard on the W2 link pads at pin 1. BLUE WIRE (HD5) - HD DRIVE A select wire to floppy drive switch. DRIVE B WIRE (HD5 not shown ) , If drive B is not used a small solder blob is to be placed from the B pad to the pad directly next to it, as shown on image above. If Drive B is to be used, the blob must be removed and the HD drive B select wire can be used. Above the red wire is 3 solder pads. The center is the select pad which must be connected to the top pad labeled "8mhz osc". A "U" shaped solder jump wire should be used to bridge the 2 large pads. Note there is 2 smaller (line type) pads which must not be shorted ( or linked ) to any pads. If the center select pad is connected to the bottom pad 8mhz ST, then the board will use the clock from the ST's 8mhz line. Though in most cases it is better to use the 8mhz osc clock which is built onboard. The jumper link is normally fitted for you when you purchase the full tested kit as it is the default option and is used that way in 99% of cases. On my test ST I have 2 header pins for testing. The right pin is pin one (normally a square pad) and pin 2 is the middle pin. 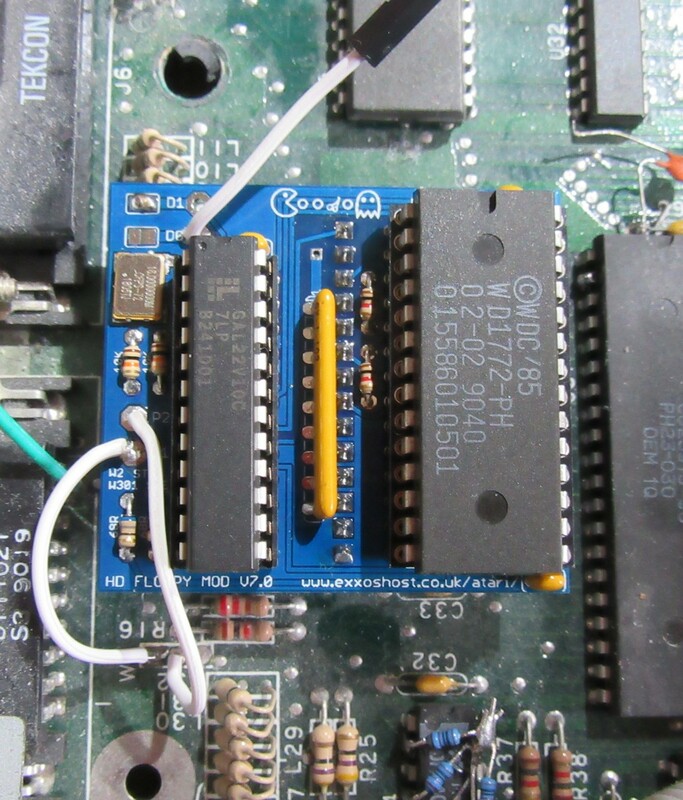 It is worth noting that pin 2 and pin 3 are normally linked via a pcb track on the ST itself. STE - The location of the 'W2' pins are located more to the left on the motherboard, whereas on the STFM (as shown in image) they are located at the rear of the ST motherboard. STE users note that the W2 connection called W301. MEGA ST - Connector is called W1. When building the full kit, it is best to solder the first header pin strip that is located under the 1772 socket first. Next cut or file the pins down a fraction otherwise the 1772 socket may not lay fully flat on the pcb. It is then best to solder the 1772 socket then solder the remaining pcb header strip. Check the length of the strip, as they can be supplied longer ( more pins ) than needed. Normal 2 pins are to be snapped off with cutters. Do not try to break them by hand as it normally does not break in the right place! The pins sometimes have a notch in 2 of the pins, these should be squashed flat with plyers, otherwise they may not push easily into the pcb. When fitting the kit to the ST motherboard, make sure it goes as low down as possible , otherwise if it sticks up too high , the floppy drive will not rest correctly. It is worth checking this before soldering it into place! It is preferable to have the WD1772 just touching the bottom of the floppy drive. You can place a small amount of thermal paste on the top of the 1772 and use the floppy base as a heatsink. Older VL1772 chips can run a lot hotter than the WD1772. 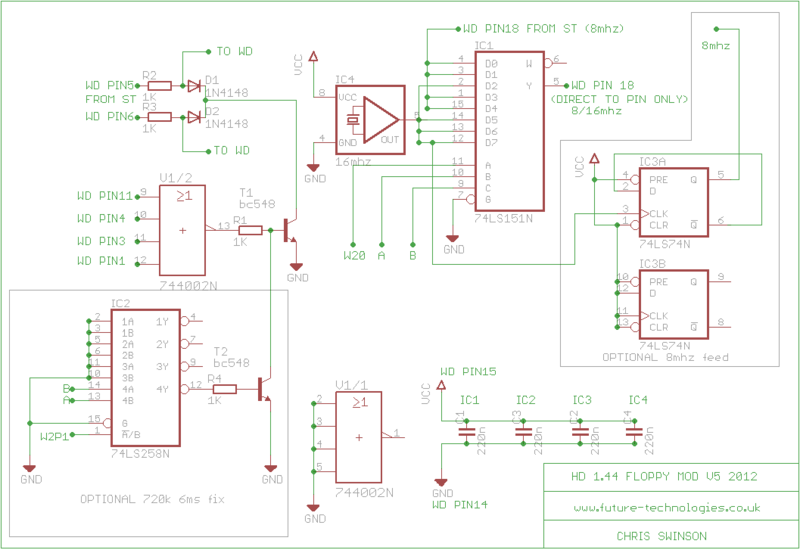 While (at the time of writing) I still have some HD5 PCBs and kits left, I have decided to publish the diagram for HD5 making it a open source project. Unlike other floppy hacks, I use generic parts which makes the design future proof from discontinued parts. It also has the advantage you do not need to a buy a programmer or any special equipment to build it. If you rip off my design in part or in full, please do the decent thing and actually give credit! Its something people are generally lacking and one of the reasons I am reluctant to publish any technical datas. Click image for higher res version. HD5 is still sold in my webstore (at the time of typing) while stocks last. HD6 sees the move from dedicated logic chips to a single GAL IC. 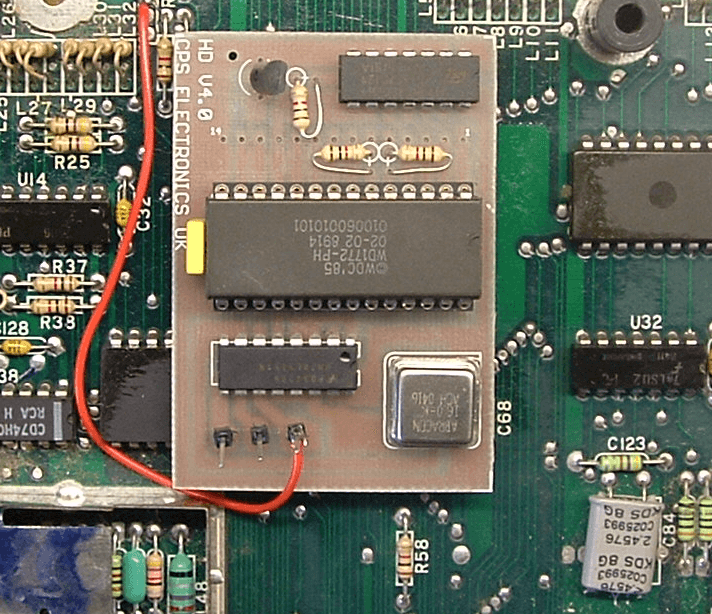 Years ago, circa 1990, Logic IC's were easily obtainable and in recent years are increasingly difficult to find. Because of this the choice was made to move over to a GAL which makes the whole design a lot smaller and gives greater flexibility of the design. While GAL chips are obsolete in recent years, they still seem obtainable reasonably well currently. One thing that has been in question for some years is the media change issue. I looked into this with TOS104. I found if I booted from a blank floppy then placed in a floppy with programs on it, and opened up drive A:, the GEM window would show blank contents. Even if the window was closed and reopened several times, the new contents would not show. Pressing ESC with the window open refreshed the window and the contents showed. So this clearly shows a issue with TOS in not recognizing the floppy change. As the design now uses a GAL, It allows more features to be added without having to add more logic chips. From my searching, the correct method for media change is to set WP (write protect) line LO when not accessing the drive. TOS polls the floppy drive while not in use and checks the WP signal. If it sees the signal is LO, then TOS assumes the media might have changed. So upon disk access, TOS re-reads the floppy FAT and then displays the correct contents. So with the jumper pad selected, this enables the WP line to go low when the floppy drive is not in use. 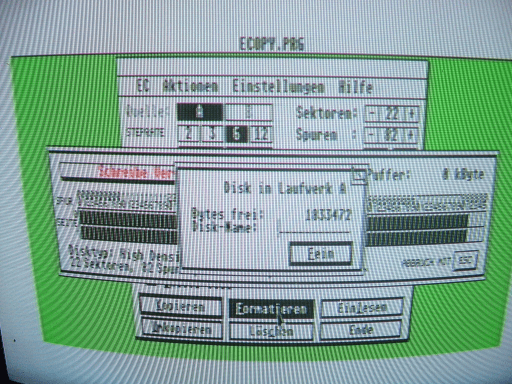 So repeating my tests, when booting from a blank floppy, and then opening up the floppy after changing it, the correct contents are now shown without pressing ESC. I wrote a small program in STOS (compiled as as TOS executable) to print out the media change status. It can be downloaded HERE. If run on a unmodded ST the message will say "Disc has definitely not been changed" constantly. On a modded ST. After loading and the floppy drive light turns off, the GAL will set WP LO and the message will say "Disc may have changed!". The message shows up regardless of if you actually change the floppy or not. The Media Change Fix is enabled by soldering over the MCF pad on the PCB. While Beta testing on my STE, I found that I had a patched TOS which sets the step rate to 6ms by default. So it would work with 720K or 1.44 floppies without having to worry about the step rate times. Though a lot of people (including myself) do not like the 720K floppies running at 6ms, it often makes the floppy drive sound really loud as its running slower. This was a annoyance of my V4 modules. V5 saw the "step rate fix" so 720k floppies ran at the proper 3ms speeds. So it seems at some point TOS206 had the same "bug". However since I have now run into issues with TOS forcing 6ms, I adapted V6 to force 3ms back on 720K floppies. 1.44 floppies are forced to 6ms (which then becomes 3ms at 16mhz speeds). So now V6 series sees correct step rate times regardless if it has been forced in TOS or not. Fitting for the V6 is similar to the V5 series, only the PCB layout has greatly changed and become a lot smaller. NOTE - colours may differ than in the image. THIN BLACK WIRE (top right of image) 16mhz line (shown on right image) NOTE I also have a yellow wire on my STE there as I have a CPU booster fitted so you will probably not have a wire there. D1 (also black wire on image) has a few choices. 1) If you never plan on using a external drive then you can leave the pad floating which will also default to 1.44 mode on the external drive. 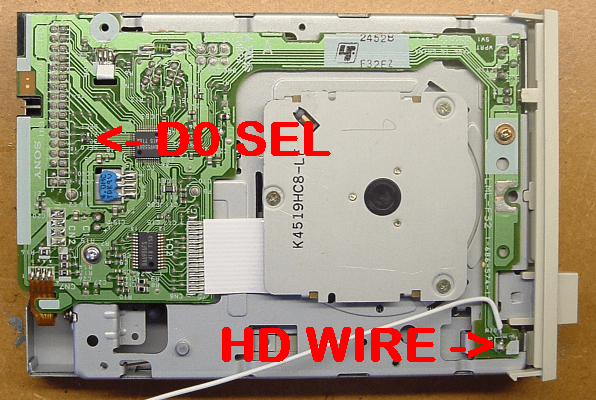 So if you never plan on using 720K external, then you can simply use a 1.44 drive and not have to connect the HD SELECT WIRE to the external drive. 2) I recommend soldering a wire on D1 to any GND point on the motherboard. This will enable 720K mode by default should you ever want to use a 720K external drive. 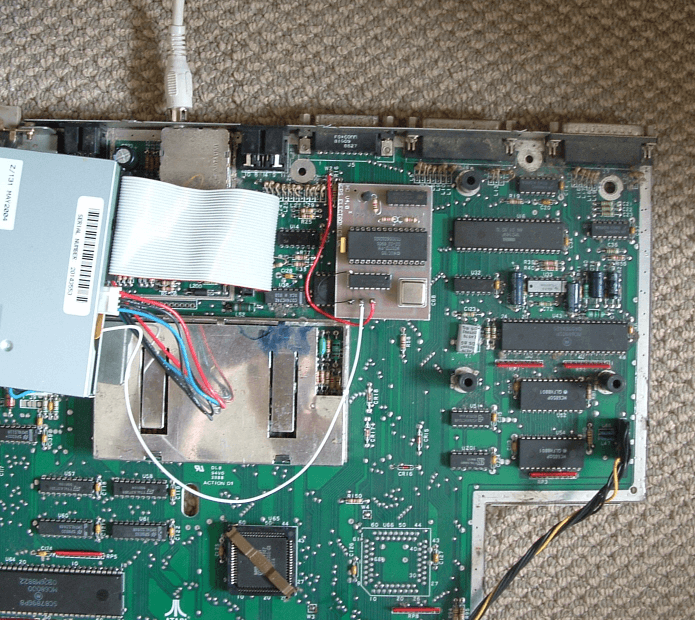 3) if you want to use 720K and 1.44 as a external drive, then you must devise a way of passing a external HD SELECT wire from the external drive to the D1 pin on the PCB. I generally fit a small jack socket on the back of my ST to run the wire. Before soldering the header pins into the PCB which connect to the motherboard, place the pins in the motherboard and the PCB. You will find the pins have to be put in at a slight angle. This is because while I was making the PCB smaller, I seemed to have overlooked the header pins moving closer together. So the V6.3 PCB is a fraction to small to align with the motherboard pins. The capacitors which are supplied may need the pins straightening to fit into the PCB. While 330R resistors are marked on the PCB, I later changed to 100R or 68R. So either value may be supplied. 100K marked on the board may be supplied with 100K or 10K. Values of resistors do not effect operation in any way. Please check with a multimeter before fitting the resistors. https://blog.troed.se/2017/01/20/the-tale-of-high-density-atari-mystery/ Troed'd blog of fitting along side a Epson 340 drive. I have designed the next revision which will be classed as Version 7. Mostly this one corrects the header spacing issues which have plagued the previous version. I have also added on a SIL array on the WD1772 databus as the DMA suffers from this a little and can cause odd hard drive or floppy drive faults without it. This one I have used a SMT 16MHz oscillator. Previous versions the oscillator was just physically too big to fit on the PCB, (dip 8 type) so it has been left off design for a long time. But now oscillators are a lot cheaper and smaller, I thought it better just to add one onto the PCB to save having to run a wire to the shifter. The board still includes the media change fix as a optional jumper setting and all the usual automatic 8/16Mhz switching etc. NOTE: The jumper pads next to D0 and D0 are to tie either drive1 or drive0 to 8MHz mode by default when not used. By default, D1 should be linked. NOTE: Wire colours supplied will vary (or be one colour) , please check where wires are actually soldered rather than going on the colours. NOTE: 1772 socket is no longer supplied as a "turned pin" type as I have had many issues with them, so they are the normal spring loaded types now. NOTE: The GAL does not need a socket (And is not supplied). The socket is only in the image as I need to test GALs for these kits and need the socket.